Pictured: (L-R): back row: Warner Chappell’s Ryan Beuschel, Warner Music Nashville’s John Esposito, ASCAP’s Beth Brinker, Sony/ATV’s Troy Tomlinson, KP Entertainment’s Kerri Edwards, Combustion Music’s Chris Farren. Front row: Producer Michael Carter, ASCAP songwriter Ashley Gorley, BMI songwriter/artist Cole Swindell, ASCAP songwriter Zach Crowell, BMI’s MaryAnn Keen. 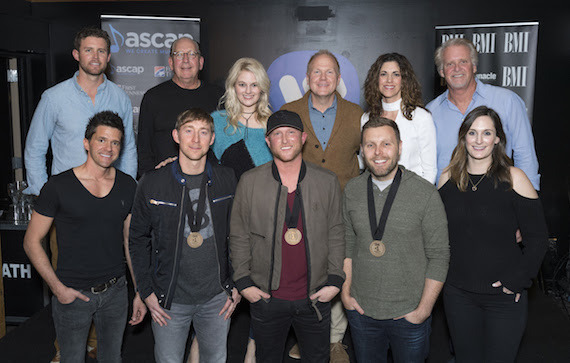 Warner Music Nashville hosted a celebration at their office for Cole Swindell’s “Middle Of Memory” on Tuesday, Feb. 28. BMI’s MaryAnn Keen welcomed the crowd on behalf of their partner,Pinnacle Bank, while ASCAP’s Beth Brinker recognized First Tennessee Bank. As she welcomed Swindell (BMI) and writers Zach Crowell (ASCAP), Ashley Gorley (ASCAP), along with producer Michael Carter to the stage, Keen mentioned that Swindell is also a NSAI Songwriter/Artist of the Year and received a Triple Play award as a songwriter in 2016. Brinker took to the stage to congratulate Crowell on his sixth No. 1 song and Gorley on his 30th. Warner Music Nashville’s John Esposito reminded everyone that Swindell’s first single “Chillin’ It” went to No. 1 almost three years ago to the day. Also taking the stage during the party were the CMA’s Brandi Simms, Combustion Music’s Chris Farren, and Warner/Chappell’s Ryan Beuschel. Guests mingled before the party and took photos in front of a Cole Swindell-inspired backdrop that included memory photos of him on the road.